So I made myself another Deer & Doe Plaintain tee. I’m not going to bore you with the details of how it was to make, I’ve already churned out and talked about a few on here. On this one, however, I made a little tweak in the pattern and that’s what I wanted to share. 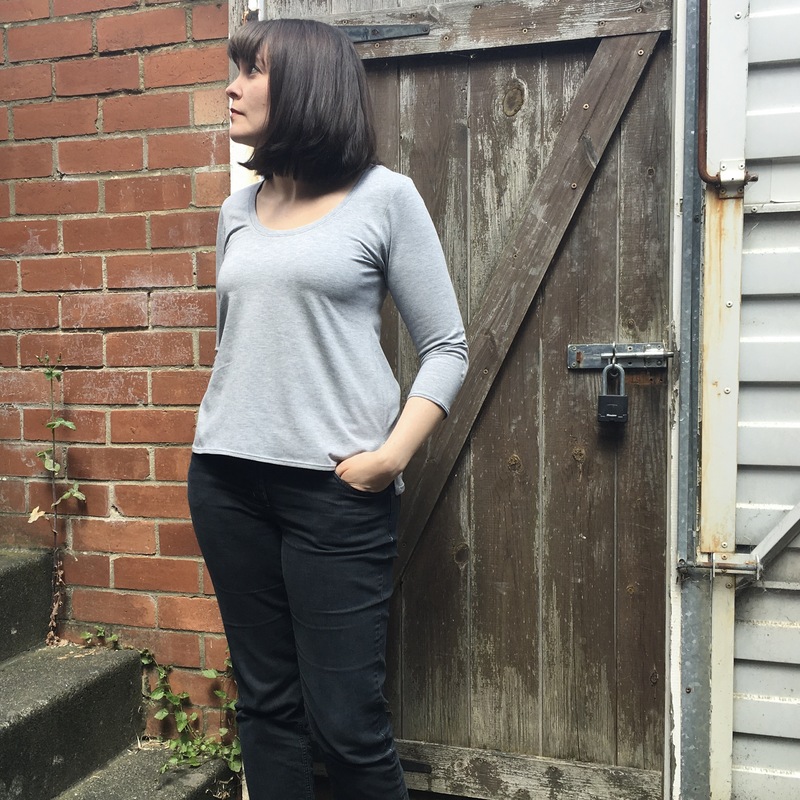 So then, good old trusty Plantain tee (the free pattern from Deer & Doe). 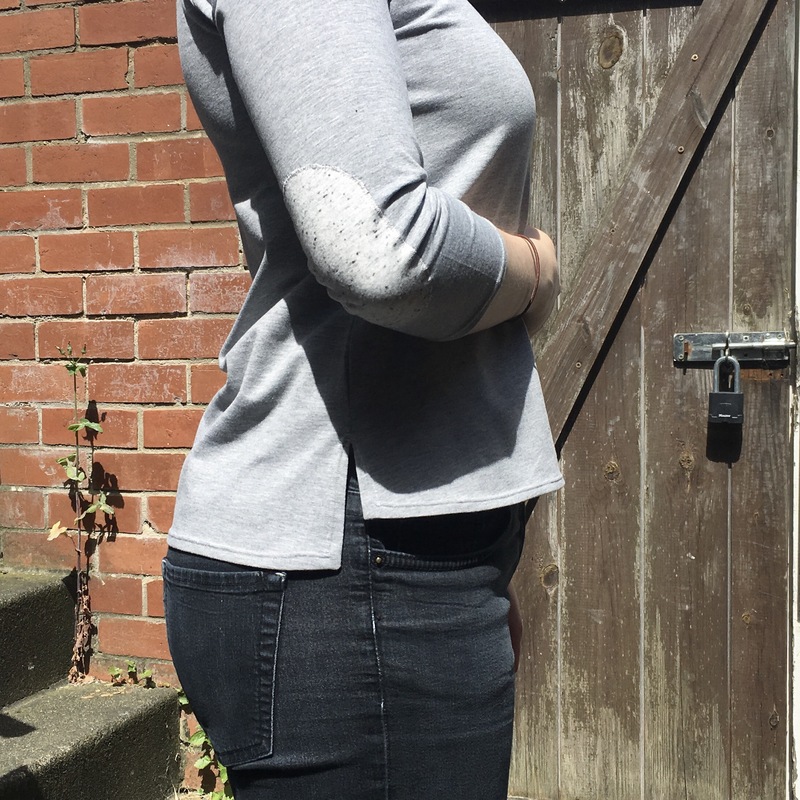 This version is made using a very minimal stretch grey jersey, hence it being a bit snug over the boobage area, they are not flattering shadows now are they?! 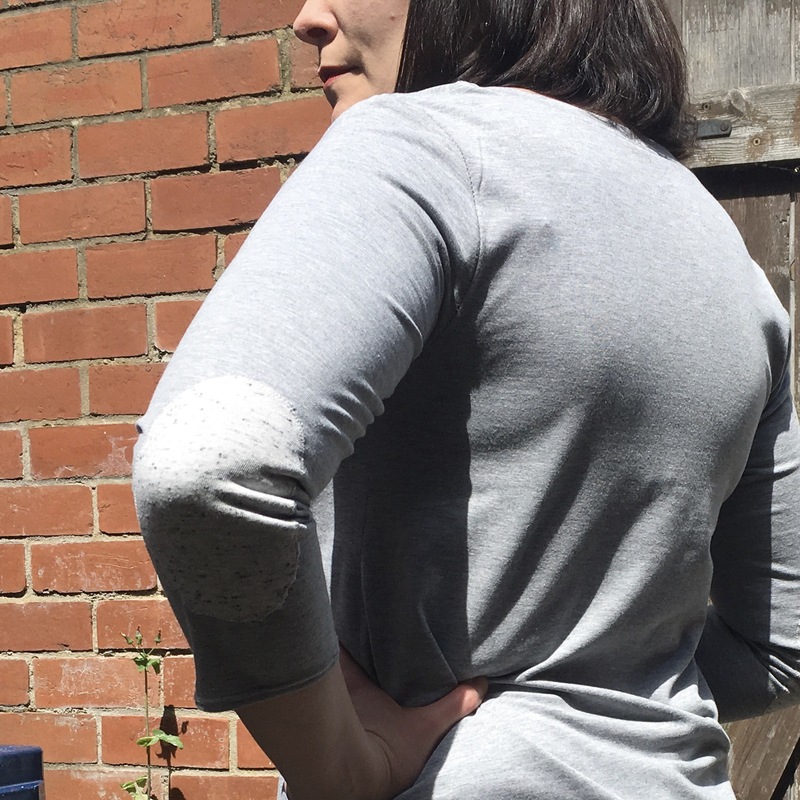 I went 3/4 sleeve length and added some elbow patches in a speckled lighter weight jersey… because… you know… elbow patches!! 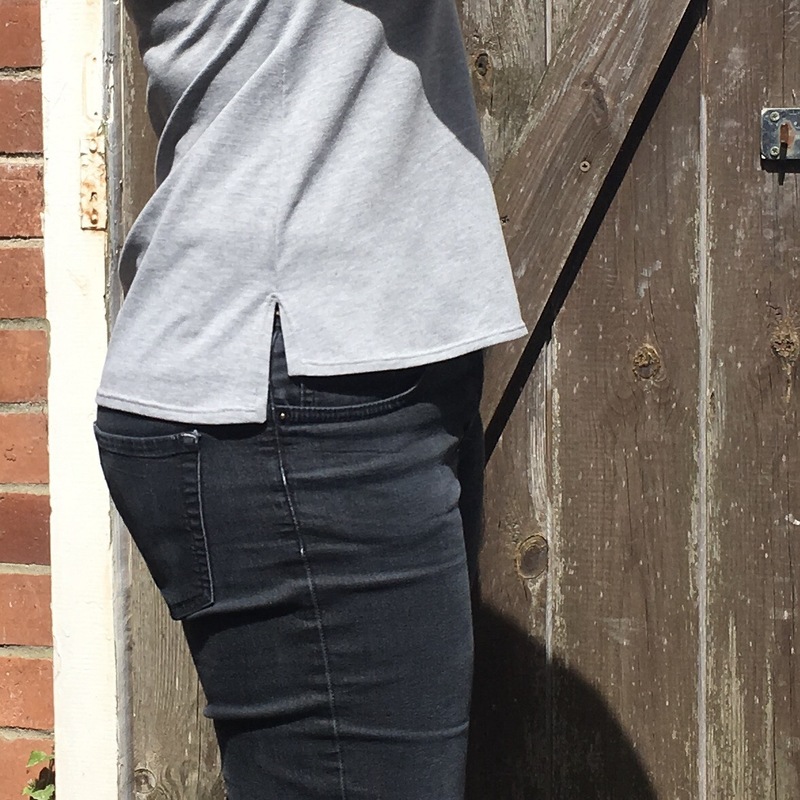 It’s all a rather non-spectacular tee otherwise… asides from my little tweak. I decided to make things more interesting and added in my own little high-low split hem! It was really a very easy pattern tweak, just cut the front an inch and a half shorter. Sewing the hem for it was a little trickier, rather than the lovely mitred corners which the Toaster Sweater includes, I just kind of folded it back and tried my best sewing it with a twin needle. Have you ever tried turning 90 degrees with a twin needle… not easy. So the vents on the sides do look a bit wobbly. I thought about using a zig zag stitch but I didn’t want it to look too home made… I guess I kind of achieved that? I like the split hem but I think next time I’ll go all out and poach the Toaster Sweater hem… it looks much more professional. 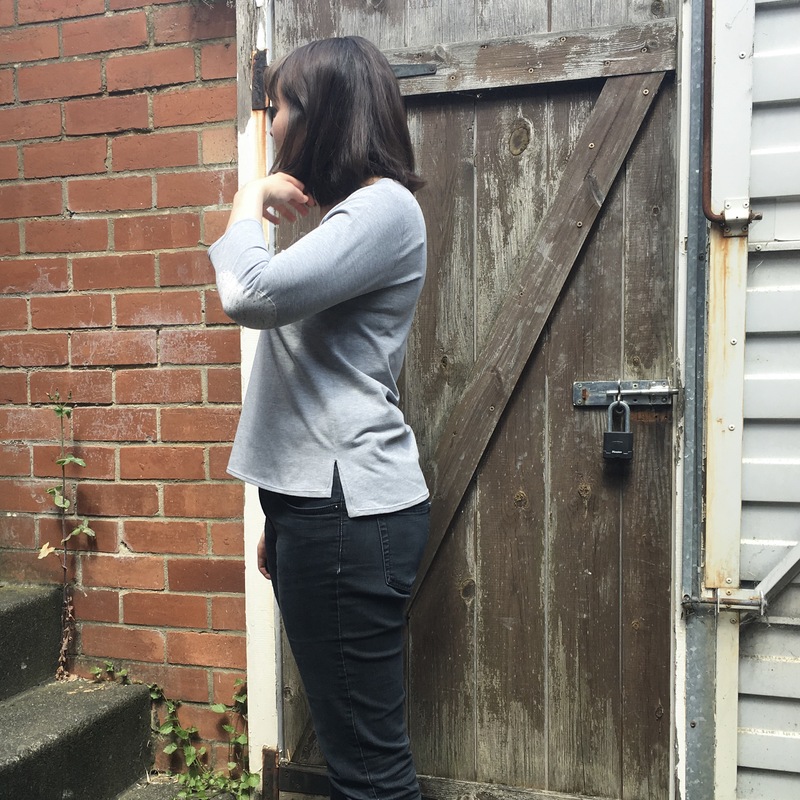 But all things considered… and by all things I of course mean ELBOW PATCHES PEOPLE!! Ahem… sorry I got a bit excited there. This is a really lovely tee, the fabric is really super soft. Sorry, can’t remember where I got it from though. Sadly, or not so sadly really, the weather has been too hot since the making of this tee to actually wear it!! Loving the sunshine though… time for some summer frocks methinks! !